Earlier this week, Beatrix discovered the household stash of winter accessories and dove in for an afternoon of dress up. 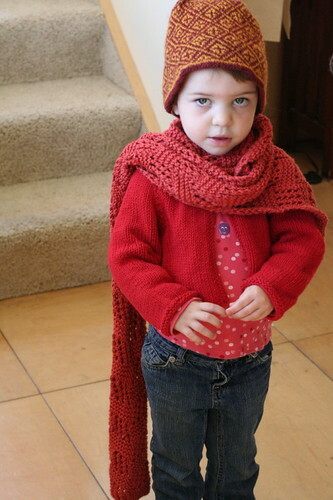 Aside from illustrating that she is a really big fan of red, Beatrix’s dress up game highlighted a problem I have as a knitter: I cannot seem to knit matching (or more accurately, not clashing) hats, scarves, and mittens. 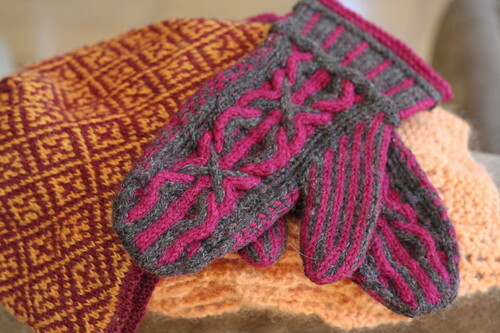 When planning a new winter project, it has never occurred to me to consider anything but the yarn choice. Before selecting yarn, perhaps I should ask myself, “Will this look awful with my bright red coat?”* Chances are, it will. I rarely care. Still, it bothers me a bit that I cannot seem to stick with a pattern long enough to eke out both a scarf and a hat. By the time I finish the scarf, I need at least a year’s hiatus from the pattern. 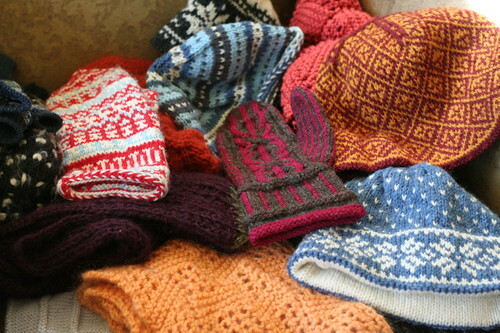 And after the instant gratification of a hat, who wants to slog through six feet of scarf? My mission this fall is to come up with a scarf pattern that will be interesting enough to continue on into the hat. It has to be possible, right? If not, please understand if you see me this winter, wrapped up in my clashing wooly goodness. Just assume I’m only out to buy cat food. *Hm… maybe Beatrix is not the only one with a penchant for reds.